Stephen Lyman was an explorer who specialized in painting the most elusive moments in nature. Through his art, you can travel into a wilderness very few have experienced and share the sensation of being in the true outdoors – discovering, studying and enjoying the all-encompassing beauty of unspoiled wilderness. 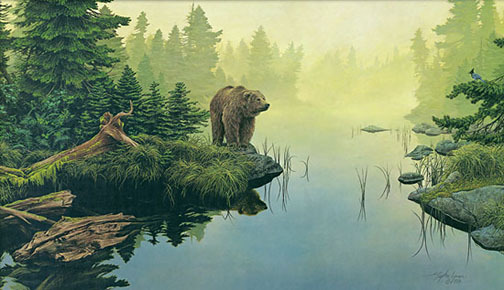 In the early morning mist, a solitary grizzly emerges from the forest, ambling through the bear grass along the lakeside. Suddenly the silence is broken by the screech of a Stellar Jay, upset by the appearance of an intruder into his neck of the woods. Knowing it would be fruitless to go after the bird, the powerful bear just stands watching, while the jay, knowing he has plenty of distance from the intruder, boldly continues to chastise him.